Show your affection in a big way with Sue Beatrice's design inspired by elephants' loving trunks. There's tender animal kingdom inspiration behind Sue Beatrice's necklace. Elephants use their trunks like hands to grasp and carry objects from twigs to trees (not to mention using them to breathe, smell, and drink). But here's the sweet part: They also caress each other with their trunks to comfort and, during courtship, entwine their trunks together. 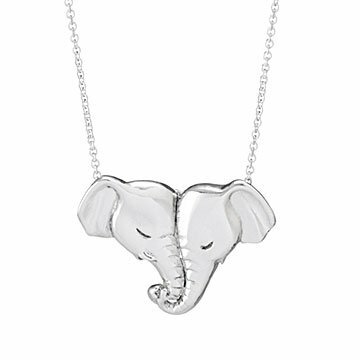 Sue's sterling silver tribute to this gentle gesture goes a step further, forming a heart from a pair of loving pachyderms. Suspended from an 18-inch chain, it makes an endearing statement for someone you love. Handmade in Sea Cliff, New York. W 1.2” x H 1”, Chain: 18"
It made for a fantastic gift! I purchased this to represent my daughter and my granddaughter Isabella's love for each other. The necklace is beautiful and I would purchase again. My wife wears it everyday! The perfect gift for her! The concept is cute however, upon removing the necklace from the box, the thin chain broke!!! Luckily my Mother contacted UncommonGoods immediately. Staff was very helpful and sent another chain to my mother within 72 hours! Not only is it built with great quality, it looks great while worn and has survived the occasional CrossFit workout without a scratch. Home run purchase.